FDA Approved and Doctors recommended Pregnancy Test. The most sensitive rapid pregnancy test for the early pregnancy detection. Take the strip out after 3 seconds and lay the strip flat on a clean, dry, non-absorbent surface. Not Pregnant: Only one color band appears in the Control Zon and No color band in the Test Zone. This indicates that no presnancy has been detected. Pregnant: Distinct color bands appear in the Control and Test Zones. It indicates that you are pregnant. The color intensity of the test bands may vary since different stages of pregnancy have different levels of the HCG hormone. INVALID: No visible band at all, or there is a visible band only in the test region and not in the control region. Repeat with a new test kit. Human chorionic gonadotropin (hCG) is a glycoprotein hormone produced by the developing placenta shortly after fertilization. In normal pregnancy, hCG can be detected in both urine and serum as early as 7 to 10 days after conception (1-4). hCG levels continue to rise very rapidly, frequently exceeding 100 mIU/mL by the first missed menstrual period (2-4), and peaking in the 100,000-200,000 mIU/mL range about 10-12 weeks into pregnancy. The appearance of hCG in both urine and serum soon after conception, and its subsequent rapid rise in concentration during early gestational growth, make it an excellent marker for the early detection of pregnancy. The test utilizes a combination of monoclonal and polyclonal antibodies to selectively detect elevated levels of hCG in urine. 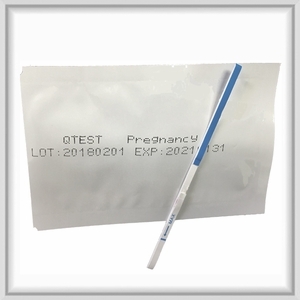 At the level of claimed sensitivity, the hCG One Step Pregnancy Test Strip (Urine) shows no cross-reactivity interference from the structurally related glycoprotein hormones hFSH, hLH and hTSH at high physiological levels. The test is CLIA Waived indicating the test is certified accurate and designed to eliminate mistakes during home use. The test can be used any time of day, but the first morning urine usually contains the highest concentration of hCG. Caution: Drinking too much water may affect your test result. Do not use the test after the expiration date printed on the package.